for creating PDF files programmatically. 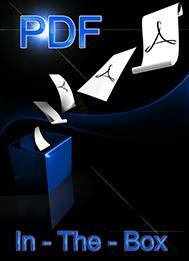 PDF In-The-Box allows Developers to produce PDF documents from within their applications. It writes native PDF format from scratch, according to programmatic orders given by the Developer. PDF In-The-Box offers an object-oriented programming interface, provided with a collection of powerful object classes: Text, Raster Image, Vector Image, Barcode, Table, Band, Cell, Layer, various controls, Note, Attachment, Mediaclip, Signature. To generate a PDF file, you've just to create objects using API methods, give them properties according to your needs then put them on the document. PDF In-The-Box is not a virtual printer driver. It doesn't need Adobe Reader® or any third-party software to create PDF files. It's self-sufficient! Developers often wish to display or print PDF documents being generated, and give end-users interactive control over these features: that's what ALL In-The-Box can do.